You will be surprised with how simple and amazing these cookies are. You can make them in no-time and everyone will love them. If you don't have a spritz cookie maker, I strongly suggest you get one. I bought mine at Michaels Arts & Craft store. They come with different "slides" so you can make tons of different shaped cookies such as pumpkins, Christmas trees, flowers, etc. 1. Preheat your oven to 350F. Line a baking sheet with parchment paper and set aside. 2. In a stand mixer with a paddle attachment, cream together butter and sugar. Once its combined, add egg, milk almond extract and vanilla extract. Scrape down the bowl as needed. 3. In a separate bowl, mix together the flour and baking powder. Slowly add the flour mixture to the butter mixture. Mix until combined. 4. For the next step, you can either roll the dough into small balls with your hands and press your thumb into them OR you can put the dough in a spritz cookie maker and press them onto the baking sheet using whatever shape you prefer (make sure you use a slide that presses enough cookie dough out to where your jelly will not be directly on the pan. This will result in it burning and that is never fun!) 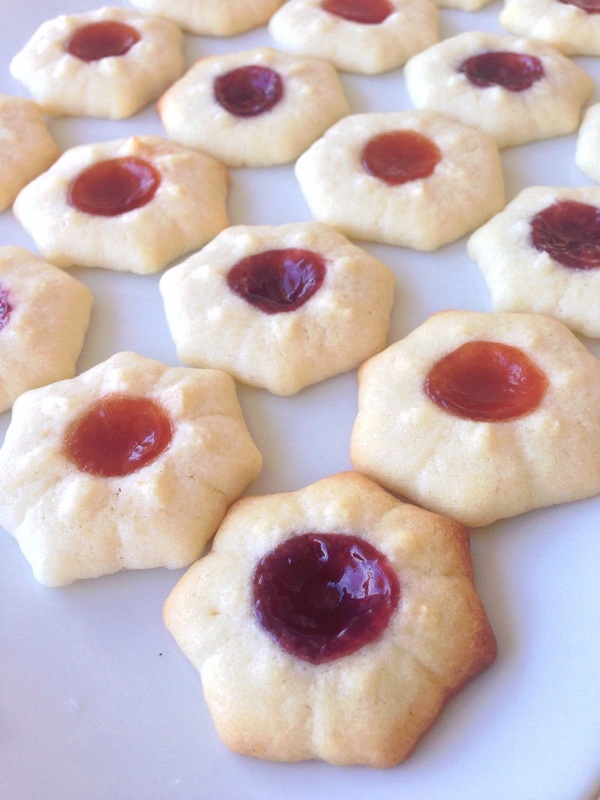 and press your thumb into the shaped cookie so there is enough space to hold the jelly. These cookies do not spread much so feel free to place the dough an inch and a half apart. Once all of the dough is pressed and ready, place a small amount (about half a teaspoon)of jelly in the middle. 5. Bake for 10-13 minutes or until the edges are light golden brown. Let cool and enjoy!